Azade Seyhan provides a concise, elegantly argued introduction to the critical theory of German Romanticism and demonstrates how its approach to the metaphorical and linguistic nature of knowledge is very much alive in contemporary philosophy and literary theory. Her analysis of key thinkers such as Friedrich Schlegel and Novalis explores their views on rhetoric, systematicity, hermeneutics, and cultural interpretation. 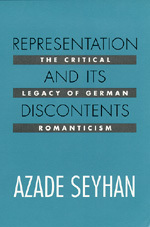 Seyhan examines German Romanticism as a critical intervention in the debates on representation, which developed in response to the philosophical revolution of German Idealism. Facing a chaotic political and intellectual landscape, the eighteenth-century theorists sought new models of understanding and new objectives for criticism and philosophy. Representation and Its Discontents identifies the legacy of this formative moment in modern criticism and suggests its relevance to contemporary discussions of post-structuralism, orientalism, theories of textuality, and the nature of philosophical discourse. Azade Seyhan is Associate Professor of German at Bryn Mawr College.